Plywood - Grade III WBP Finnish Birch plywood. PEFC and FSC accredited. 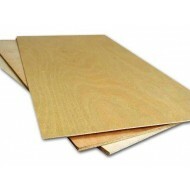 Light Weight Plywood - Light weight poplar plywood commonly used in model aircraft construction. PEFC and FSC certified. Grade III WBP Finnish Birch plywood..